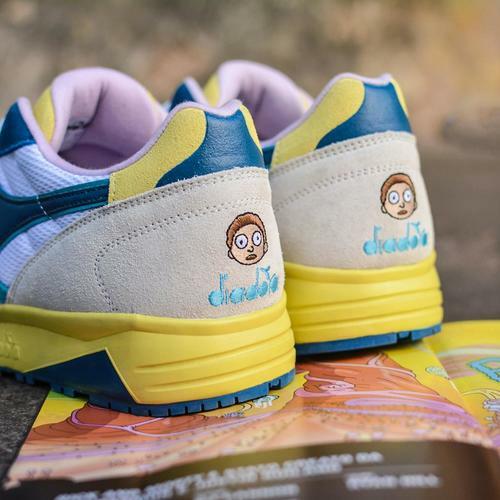 Mad scientist Rick Sanchez and his grandson Morty Smith just launched their own special edition Diadora collab exclusively via Foot Locker in celebration of the retailer's seventh annual "Week Of Greatness." The two main characters of the popular Adult Swim show are featured on the Diadora N902 and the B.Elite, as well as a range of apparel. The N902, inspired by Morty, is built on a white mesh and grey suede base accompanied by splashes of bright yellow and blue as a nod to his T-shirt and jeans. Rick's special edition low-top B.Elite comes in a white leather along with mint green, blue, and lavender detailing to match his unmistakeable look. Each pair is adorned with the character's face, the show's title in its signature font on the tongue and time traveling inspired insoles. According to Diadora, the limited edition sneakers are available online via Foot Locker, as well as select Foot Locker and Footaction stores.